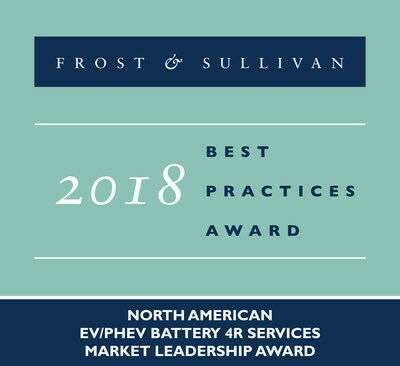 SANTA CLARA, California, Feb. 7, 2019 /PRNewswire/ -- Based on its recent analysis of the North American electric vehicle/plug-in hybrid electric vehicle (EV/PHEV) market, Frost & Sullivan recognizes Spiers New Technologies, Inc. (SNT) with the 2018 North American Market Leadership Award. SNT is the only market participant that handles repairing, repurposing, refurbishing, and remanufacturing (4Rs) of EV batteries for almost all automotive original equipment manufacturers (OEMs) in the United States. It leads the market in the scale of services provided and growth rate, and is also the sole participant to expand internationally. Its global footprint enables it to create market and technology synergies that will help it acquire or partner with similar companies abroad. "Among the 4Rs, SNT is specifically adept at repurposing batteries to build energy storage systems, called Watt Towers. These systems can be placed in any weather condition and be used in applications ranging from solar to general uninterruptible power supply (UPS)," said Vasudevan Rajesh Senior Research Analyst. "It also offers safe and fire-proof storage, battery observation, data management, and dealer network management. Every OEM has a dedicated data server to ensure data privacy and security." Strategically located in Oklahoma, SNT is able to cater to OEM dealerships nationwide within 24 hours and is able to make dedicated OEM facilities with access controls available. It recently opened its first European facility in the Netherlands in 2018, and is planning to establish a facility in Shanghai by early 2019 because China has the largest population of EVs in the world. Simultaneously, it is looking to expand its presence in the United States and will set up its second facility in either California or Nevada. Although there are new battery technologies that use silicon anodes and grapheme pellets, they pose no threat to SNT in the near future because they have yet to prove their feasibility for mass production and automobile use. SNT's products have multiple applications and go through both a full line test and an end-of-line test. Its refurbished batteries have the same warranty as those provided by OEMs, but with lower battery capacity. Significantly, SNT is eligible for up to $1.9 million in state incentives over the next 10 years for bringing jobs to Oklahoma. Working with government departments will help reduce its marketing expenses, and this will endow it with an advantage when negotiating contracts in other states or even overseas. "SNT has invested heavily in resources, and its scale of 2,000 batteries per month has facilitated the creation of a large knowledge base regarding failure rates, material durability, and battery mileage. The data capabilities of the company's platform, ALFRED, presents insights into measures that would be otherwise untraceable, including environmental stress," noted Vasudevan Rajesh Senior Research Analyst. Along with its safe storage and handling capabilities, its outstanding value positions SNT ahead of the competition in the North American EV/PHEV 4R battery services market." Each year, Frost & Sullivan bestows this award upon the company that demonstrates excellence in growth and customer value. Attaining loyal customers who became brand advocates allows the company to grow and achieve a market leadership position. By committing to the customer at each stage of the buying cycle and continuing to nurture the relationship, this award recognizes a company's increased market share over time. About Spiers New Technologies, Inc.
Spiers New Technologies Inc (SNT) is the leading full-service provider of "4R" services (repair, remanufacturing, refurbishing and repurposing) for advanced battery packs used in hybrid and electric vehicles. SNT's 4R services allow vehicle OEM's to optimize the life cycle management of their battery pack inventory and maximize its value.